Nothing causes more conflict and heartache in a divorce case than the issue of child custody and access, now called child care and contact. Financial arrangements may cause arguments, but care and contact (formerly called access) are the emotional heavyweights in any divorce settlement. We look at the issues involved, and explain how the Children’s Act 2005 attempts to minimise disputes and put the best interests of the child first. What is the Children’s Act? The Children’s Act is a radical piece of legislation. It shifted the focus from the rights and power of the parent, as embodied in the word “custody”, and brought children’s rights to the fore (denoted by the word “care”). The Children’s Act 2005 brought South Africa’s child care and protection law in line with the Bill of Rights and international law. It is founded on the principle that every child has the right to family care; the right to be protected from abuse, neglect, maltreatment and degradation; and the right to social services. These rights are also found in Section 28 of the South African Bill of Rights. Are child custody battles a thing of the past? Most couples bringing a child into the world hope to raise the child in a harmonious family unit, whether married or not. If the relationship subsequently breaks down, one of the hardest things to come to terms with is not seeing one’s child every day. Historically, child custody was usually granted to the mother, with the father having access or visitation rights. The system was based on the traditional view of the mother as the primary caregiver, and the language reflected the power that was so often at the heart of family conflicts. One intention (among many) of the Children’s Act was to put an end to custody battles that could do more harm to a child than the divorce itself. By putting the interests of the child first, parents have to put their own egos aside and focus on their mutual responsibility to care for the child. The Act also recognises the importance of fathers in a child’s upbringing. There is far more emphasis on shared care and an agreed approach to parenting than the historical convention of maternal custody and paternal visitation conceded. But it is inevitable that someone will feel short-changed. It is very hard to satisfy everyone’s wishes when dealing with compromise. Remember – the most important individual in the negotiating process is the one who may not even be at the negotiating table – the child. The divorce attorney will encourage the divorcing couple to agree all aspects of the child’s care. This includes where the child will live, how parental contact will be divided, maintenance arrangements, and other important factors in a child’s upbringing such as social, cultural and religious involvement. If they cannot agree, they will be encouraged to draw up a parenting plan, which describes the child care and contact provision. The Children’s Act does not automatically require a parenting plan, but has introduced the mechanism to encourage co-parenting and co-operation between parents. Section 33(2) of the Act does require parents to agree on a parenting plan before seeking the intervention of the court if they are unable to agree on the discharge of their responsibilities and rights. They can seek help from a family advocate, social worker or psychologist in drawing up the plan. Children deemed old enough and in possession of sufficient maturity will be given an opportunity to express their wishes, and their views will be taken into consideration. But the principle of the best interests of the child is paramount. Children may know what they want but they don’t always know what’s best. The parenting plan must be registered with the Family Advocate. Where both parents are involved in a child’s care, they are considered to be co-holders of parental rights and responsibilities, or co-parents. As such, each co-holder may act without the consent of the other co-holder when exercising those responsibilities and rights, except where the Act does not permit it (such as relocating overseas with the child). The biological parents of a child are considered to be “natural guardians”. Sometimes it is necessary for the Court to appoint “legal guardians”. This may be because both parents have died or one has died and the other cannot be found. Or there may be circumstances that render them unfit to provide care to their child, either temporarily or permanently. Only the High Court can appoint a guardian, as it is the “supreme guardian” of all children in South Africa. Parents can also name a guardian in a will, to care for their child in the event of their death. The guardian must be a “fit and proper person” and must agree to the guardianship. If not, the Court will appoint a guardian. 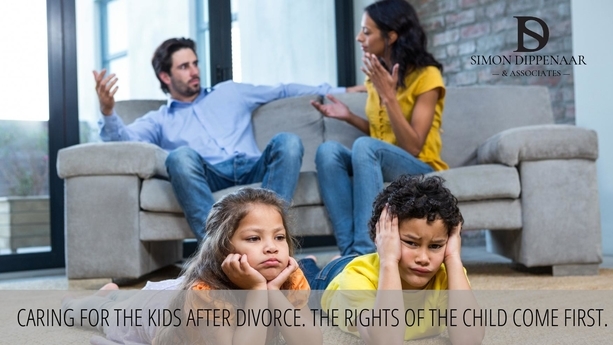 Divorce is a painful process, especially where there are children involved. Where the financial stakes are high, the choice of divorce attorney is often determined by a track record in litigation and in achieving high-value settlements, often at the end of a hostile and combative process. But where there are young children to consider, it is far more important to reach a settlement that treats all parties with dignity and respect. The Children’s Act ensure the interests of the child come first, but it is also critical to avoid a showdown between the parents, which can have a lasting impact on the mental health of the child. Cape Town attorney Simon Dippenaar is an expert in family law and has a reputation for “empathy and professionalism, with a personal touch”, to quote one satisfied client. If you’re going through a marital break-up, we will support you and your children through the process and help you reach the best possible outcome for everyone. Call Simon on 086 099 5146 or email sdippenaar@sdlaw.co.za. This entry was posted in Custody and tagged child care, child care and contact, child contact, child custody. Bookmark the permalink.